Zhinous Nemat Mahmoudi (1), a member of the National Spiritual Assembly of the Baha’is of Iran, was tried and convicted by a secret court without access to legal representation, and was executed at the age of 52 on 27 December 1981. She was a successful woman; a founder of marine meteorology; an author of the Geographical Atlas of Iran; and the first woman to head the Iranian Meteorological Organization. At 19, she married Houshang Mahmoudi, film director and the first presenter of children’s programs on Iranian television. They had two daughters. In August 1980, Houshang Mahmoudi disappeared, and his name was added to the list of assassinated members of the Bahá’i community. Before her execution, Zhinous was witness to and narrator of the account of the execution of the seven Baha’is of Hamadan. Ariana Mahmoudi, one of Zhinous’s daughters, has compiled Zhinous’s recollections of this period in her book, “Martyrs of the Faith”, dedicated to her parents. Following are some segments from the book. It took four days from the first reports until the final news. The first report was regarding the visit of the agents to our friends’ homes in Hamadan to take inventory of their possessions to be confiscated. The last report came on Sunday 13 June announcing the tragic martyrdom of those saintly souls. Our past experience of inventory taking of confiscated property of prisoners made all of us very anxious. It is obvious how we got through those four days. All of the beloved friends in Hamadan were praying but the only answer to their prayers may have been that our loved ones found the spiritual strength and fortitude to endure those last horrendous moments. After the martyrdoms of Dr. Anvari and Dr. Dehghan in Shiraz, their files had been sent to Tehran and were apparently kept there until recently. The Shari’a Judge (religious magistrate) of Hamadan had been in Tehran for a month to get his orders and special instructions. When we heard that their files had been sent to Tehran we were all concerned because only the files of those who were to be executed were sent to Tehran for the approval of the Central Committee. 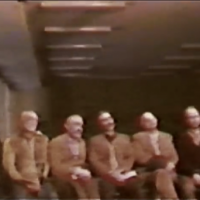 But the answer to enquiries was that all prisoners’ files had to be sent to Tehran so that they would not meet the same end as Anvari and Dehghan; and we believed them. In March our loved ones were taken to court ostensibly to be enlightened and were kindly told to recant their Faith. On June 10, when they went to take inventory of their property, one of the people in charge stated that they had been sentenced to death and were waiting for the Shari’a judge. That same day at 10 p.m. they were told to gather their belongings and get ready to appear in the revolutionary court. They prepared themselves; they knew what that meant. Their fellow prisoners were weeping but these devoted souls were joyously consoling them. What a wondrous sight! He who was going to the gallows was giving solace to the onlookers. The guards returned in an hour to announce that there was a change in the plans. These tactics of last-minute changes in execution orders were an added flavor to the life of prisoners. The next day, Thursday, was visiting day. It was the last occasion for the families to visit their loved ones. But they still could not believe it. They were calm and stoic as always. They sang the praises of their Beloved and were prepared for any calamity in His path. Friday, nothing happened. On Saturday evening at 10:30 p.m. the guards returned to take them to the revolutionary court. This time our beloved friends did not need to prepare themselves; they were ready. Their fellow prisoners recounted that they had bathed that morning, cleaned and ironed their clothes and gathered their belongings. Clean and pure, they moved with dignity and nobility. They all knew that the altar of the Beloved was awaiting them. They did their utmost to look their best to meet their Beloved. Their fellow prisoners were once again heartbroken and in tears but they were joyous and smiling just as they had been every day since the first time they were taken to be executed and remained so while they were being executed. The smiling and ecstatic faces on their blood-soaked bodies attested to that. The seven saintly souls descend the steps, joyous and smiling. The formidable group wave goodbye while their disconsolate friends look on in awe from the top of the stairs. Before they are taken away their friends try to call their families to notify them but the guards stop them. They say, “Let them sleep tonight; they have a hard day ahead of them tomorrow.” No one knows what happened next. One of the friends who was driving by the Moslem cemetery after 11 p.m. that night observed that the revolutionary guards had blocked the road. At 2 a.m. their tortured and bloody bodies were delivered to the small Khomeini Hospital. The next morning a Bahá’i nurse at the hospital found out and informed the friends that they had been martyred. But the events began ten months before. 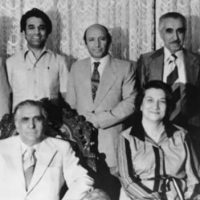 In August 1980, ten days before the abduction of the members of the National Spiritual Assembly of the Baha’is of Iran, six of the friends – Mr. Motlagh, Dr. Vafaei, Dr. Naimi, Khazin, Khandel and Sohrab Habibi – were arrested and imprisoned by the revolutionary court. Mr. Motlagh, Khazin and Soheil Habibi had also been arrested the previous summer – July and August 1979 – and held for periods ranging from a few days to a month and released by temporary court order. Drs. Naimi and Vafaei were also interrogated. During all these proceedings the magistrate was one of the most famous members of the Islamic Propagation Organization and a fervent enemy of the Faith. They were accused of being members of the Spiritual Assembly, hiding Assembly documents, attempting to pioneer and similar matters. 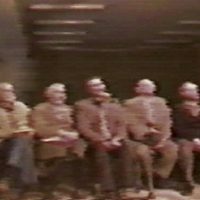 When the six above-mentioned friends were arrested for the second time on 9 and 10 August 1980, they were released on 11 August on a three-day pass. But on 12 August, before the three days had elapsed, the revolutionary guards invaded their homes to arrest them and take them back to prison. Mr. Khandel had only been elected to the Spiritual Assembly in May but his unflagging services on various local and national committees were reason enough for his arrest. At first, the accusations were the same as the previous year but with stress on their beliefs and their membership in the Spiritual Assembly. They were held in a small 2 x 2.5 meter cell that was extremely filthy and foul smelling and was adjacent to the prison toilets. Due to the lack of facilities for the large number of prisoners, their cell was always inundated with filth. The cell was so small for six persons that they had to take turns to lie down to sleep. They spent 137 unendurable days in this cell through sheer spiritual fortitude. They were not allowed any visitors during this period but some of the prisoners who were grateful to Dr. Vafaei for his kindness and care would send and receive messages from their families. During this hot sweltering summer they were not able to bathe even once. Occasionally when they were allowed to leave their putrid cell they would soak their towels in the prison yard shallow pool – obviously of questionable purity – to help each other clean themselves enough to gain a modicum of relief. From the main section of the prison they were transferred to the political prisoners section where they were all put in a larger 5 x 6 meter cell. Of course, one or two other prisoners would often be placed there. Here they were allowed two family visits per week until they were executed. In January they were prosecuted individually and then in February there was a general prosecution meeting. The charges were in essence an indictment of the Bahá’i Faith. They had prepared such an outstanding defense that the Shari’a judge thought they had obtained assistance from outside the prison. He wanted to know how they acquired all those supporting arguments – as they had used many citations from the Qoran. They replied that they had access to the Qoran in prison and had used it. I do not know if a verdict was reached. There were various reports until the report about their files being sent to Tehran was received. Apparently the files had been sent in March and the ruling was carried out on 13 June after the return of the Shari’a judge from a month-long trip. What occurred on that 13th day of June 1981, that dreadful day reminiscent of the massacre of Karbala (2), is another story. At 7 a.m. the news came that there were seven bodies in the morgue. This was reported by one of the Bahá’i women who worked at the hospital. At once the anxious families tried to find out if the report was true. We were also informed. It was true; the calamity had taken place. They had thrown their bloodied bodies on the ground in such a way that clearly showed the extent of their hatred and lack of respect for even their lifeless bodies. There was money thrown beside their bodies by Moslem spectators for the expiation of the sins of their co-religionists. But more horrific was the sight of their tortured and cut up bodies. Within an hour there was pandemonium. It is unclear how people found out but several thousand had gathered in the hospital; apart from a few hundred Baha’is the rest were Moslems. When the hospital courtyard was full they closed the hospital but people kept coming and staring through the rails. Within the courtyard chaos reigned. Whatever happened was spontaneous. The friends asked for an ambulance to take the pure bodies to the Baha’i cemetery. The hospital authorities refused. They called the mayor and informed him that if they were not provided with an ambulance they would carry the bodies to the cemetery one by one on their shoulders. Confronted with their zeal and determination, the order was given to let them use an ambulance. The police were suggesting to the non-Baha’is not to let them remove the bodies right away so that they could be displayed for the people to see the extent of the tragedy. But there was no need; the inquisitive citizens of Hamadan had somehow learned of the event in record time and had come to see for themselves. The ambulance provided was old and dirty. The rear windows were broken. They wanted to use this opportunity to further insult and belittle. But the end result was that on the way thousands of people saw the tortured bodies through the broken windows and witnessed the magnitude of inhuman and brutal treatment of these innocents who had served them. When the bodies were laid in the ambulance they noticed that Hossein Khandel’s shattered and skinned fingers were the first things that could be seen by anyone looking into the ambulance so they ordered the driver to drive fast but the valiant Baha’i youth threw themselves in front of the ambulance and told him he must keep pace with those who were accompanying the ambulance on foot. Thus the driver was forced to slow down and within a short distance the crowd of onlookers grew so large that at times he could not advance at all. Thousands joined the procession. All the roads were blocked. At first the police were deployed to control the crowds but they soon realized that it was impossible and left. The bodies were transferred to the washing room. The excited crowd rushed in to see; they broke the windows. The Baha’i youth protected the room by creating a human chain and persuaded the crowd to enter two by two to see what their brethren, those with hearts of stone filled with hatred and prejudice, had committed. Thus, hundreds of Hamadan citizens entered two by two and viewed those tortured bodies. Before the burial ceremonies were over the whole town, young and old, knew what had been done to the innocent service providers of their town. There were numerous injuries to their bodies. It appeared that they had been tortured in front of each other in order to extract a recantation. It seemed they had been shot as a cover-up after they died. Mr. Khazin’s chest was crushed and had been cut with a sharp object; his arms were shattered. The fingers on Mr. Hossein Khandel’s left hand were crushed and an 8 x 8 cm patch of flesh had been cut out of his abdomen, seemingly to get rid of evidence of deep burns in the area. Dr. Nasser Vafaei, that revered physician whose kindness to the poor and downtrodden was known to one and all, had apparently died from severe injuries to his thighs and back. Soheil Habibi’s arm was shattered; it was said that when he raised his arm in protest against his killers’ inhuman behavior they crushed it. Dr. Naimi’s beloved face was bloodied; he had bled to death from injuries to his lower body. There was a clear burn mark in the shape of an iron on the back of Sohrab Habibi. Nine bullets found in various parts of his body attested to the hatred and vengefulness of Mr. Hossein Motlagh’s killers. In addition to enlightening and informing the general public and bringing the two communities closer together, this event affected the Baha’i community to such an extent that it engendered a public display of loathing and remorse that forced the Shari’a judge of Hamadan to appear on local television on the fourth day to justify the executions with dubious and implausible explanations that only served to further disgrace and discredit him and his cohorts. 2. Reference to the martyrdom of the grandson of Muhammad and third Imam of the Shi’i branch of Islam in the year 680 on the plains of Karbela — the founding act of the Shi’i “Party” of Islam.